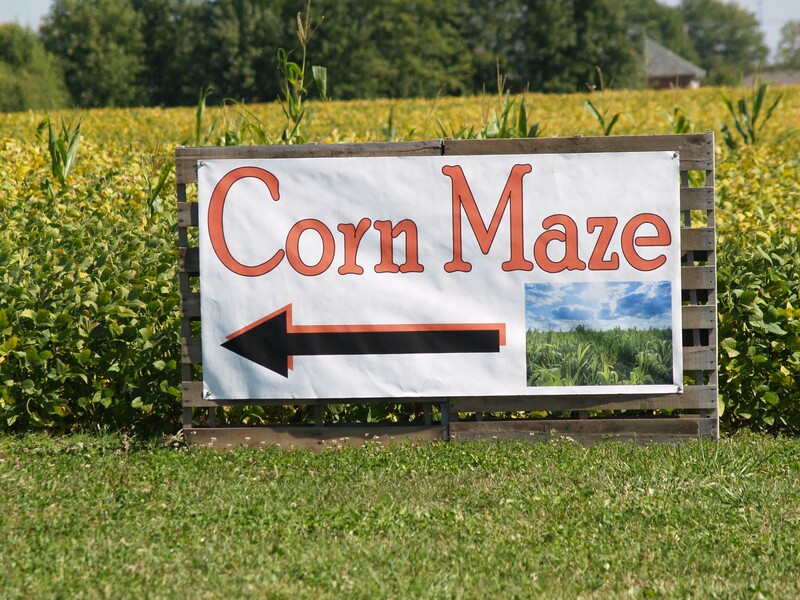 Hendricks County boasts two popular mazes during the autumn months, each of which is sure to delight visitors and residents of the area as we kick off the fall season. Coincidentally, each maze has a canine theme to it this year, and as I like to do for these types of attractions, I took two critics along with me to each maze: my 7-year-old and 6-year-old daughters. The Wolf of McCloud One of my favorite spots in Hendricks County is McCloud Nature Park, just outside of North Salem. For the past three years, the park has mowed Halloween-themed patterns into the prairie behind the Nature Center. My girls and I have navigated a spider web, a pumpkin, and a bat in the past, and this year’s design is a wolf -- the Wolf of McCloud. Roughly 40 acres in size, the Wolf of McCloud rears its head and howls at the moon as adventurers enter through its paw and try to find their way around the wolf&apos;s body and back out the paw without getting lost (too many times). It&apos;s a colorful adventure, as the wildflowers are in bloom and some of the trees are starting to show signs of autumn foliage. As the season progresses, the color out there will be stunning. The Wolf of McCloud is free to navigate, and my girls loved it. I have one who likes to run ahead and figure things out herself, while my other one pokes behind and laughs at her older sister for every wrong turn she makes. My oldest was apparently attempting to break the world record for fastest maze navigation, but my youngest enjoys taking it at a slower pace, stopping to smell the roses (er, wildflowers) along the way. She also likes to investigate bugs, laugh at me for stepping in "poop" (it was mud!) and speculating the source of every noise she heard in the maze. In her mind, every rustle of the prairie foliage was either her sister taking a wrong turn again or a cross between Bigfoot, a bear and a T-Rex that was about to jump out and eat us. (Don&apos;t worry. Nothing jumped out at us, so the maze is kid-friendly for all ages.) The Wolf of McCloud is open during daylight hours every day through Halloween. Beasley&apos;s Corn Dog The other maze in Hendricks County is located at Beasley&apos;s Orchard in Danville, Indiana, and this year&apos;s theme is "Beasley&apos;s Corn Dog." 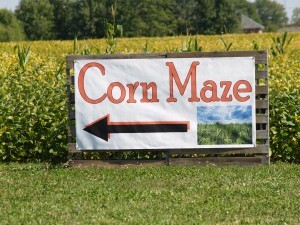 Cut into an 8-acre cornfield, this four-mile-long maze is enormous. 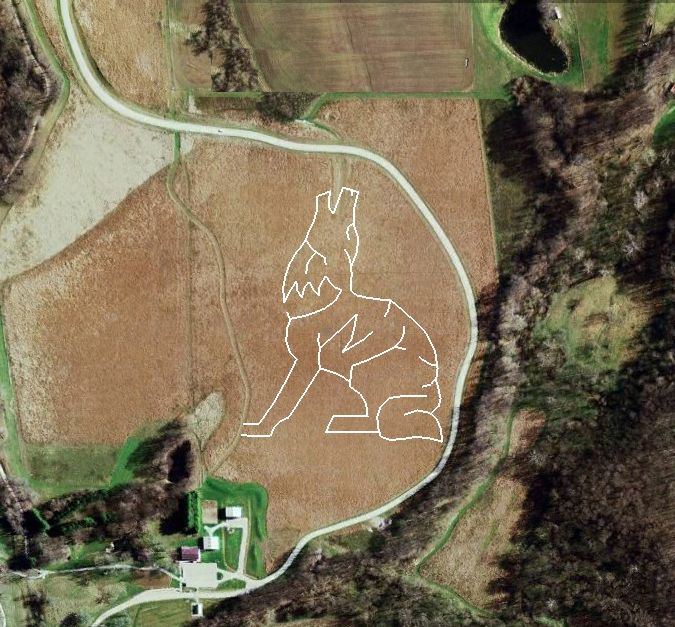 It&apos;s Beasley&apos;s 11th year of doing a corn maze, and this one is designed by Brett Herbst to bring attention to animal rescue and adoption. The Hendricks County Humane Society and several local animal rescue groups bring cute little puppies and kittens out there that act as kid magnets in hopes of finding the animals a loving home. Once I shifted their focus from the puppies to the Corn Dog, we paid our entry fee -- $8 for ages 12 and up, $6 for ages 6-11, and kids 5 and under are free -- and dove in. Since this maze is much longer and more complex than the Wolf of McCloud, Beasley&apos;s provides adventurers with a passport. As you walk along, you answer questions, and if you get them right, you get good directions through the maze. If you answer them incorrectly, you&apos;re immediately dropped into a bottomless pit, never to be heard from again. (Okay, so maybe there&apos;s no bottomless pit. You just get sent on a slightly longer path through the Corn Dog.) As with the maze at McCloud Nature Park, nothing jumps out of the corn to scare you, so it&apos;s appropriate for kids of all ages. It took us a little over an hour to get through it, though, so it may be a little much for the younger kids to walk through. Both of my girls were worn out by the end of it. Beasley&apos;s Corn Dog is open every weekend through Oct. 27: 10 a.m. to 5 p.m. on Fridays and Saturdays, and noon to 5 p.m. on Sundays. Come get lost in Hendricks County this fall by visiting the Wolf of McCloud and Beasley&apos;s Corn Dog!